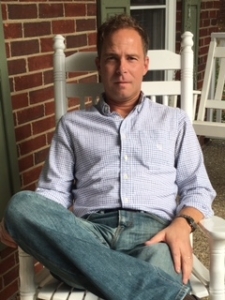 A past winner of the IPPY Award, James Markert is also a screenwriter, a producer, and a USPTA tennis pro. He wrote and co-produced the new feature film and tennis comedy, 2nd Serve, starring Josh Hopkins from Cougar Town. 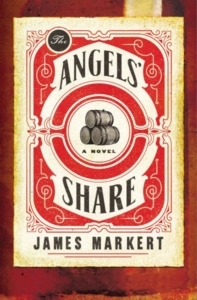 James’ latest book, The Angels’ Share (HarperCollins), released last month. He is currently working on his next historical, All Things Bright and Strange. Future novels on his to-be-written list run the gamut of history, from time periods and topics like Charles Dickens, Jekyll and Hyde, Prohibition, the Dust Bowl, the Sixties, both World Wars, the Golden Age of Magicians, and a series on Medieval Cathedral building. He and his wife, along with their two children, reside in Louisville, Kentucky. At what point in your life did you know you wanted to be a writer? What happened next? What’s funny is that I didn’t even like to read until I was a junior in high school. And then my English teacher, realizing that most of us didn’t want to read the so-called classics, allowed us to read Stephen King the second half of the year. Not his scarier books, but Rita Hayworth and the Shawshank Redemption, The body, The Green Mile, and the class was really engaged in both the reading and the discussion. At that point I devoured every Stephen King novel I could get my hands on and ultimately decided I wanted to write books too. I went to the school of hard knocks and learned how to write through rejection. 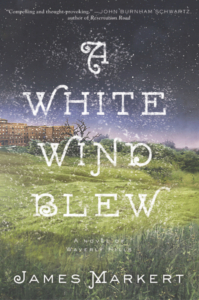 It wasn’t until my fifth novel that I signed with an agent and sold my first book, A White Wind Blew. But I had thick skin and took criticism to heart, and every novel got better, and every rewrite got better, until finally I think I now know what I’m doing. Great novels usually include a plot twist to make the story better. Have you ever experienced a real-life “plot twist” that made your personal story? Hmm, at the risk of sounding boring, I can’t think of a major plot twist, unless the birth of my children count? For certain that was a life-changer, something that made my personal story better, although at times they make me want to rip my hair out : ) I did dedicate The Angels’ Share to both of them. It is a story, in part, about miracles, and they were two miracles for me, although I nearly passed out during both births … which could have been yet another plot twist! Let’s talk about The Angels’ Share (HarperCollins, January 2017). Please tell us about it. The Angels’ Share takes place in 1934, in the fictional distilling town of Twisted Tree, Kentucky, during the heart of the Great Depression and right after the repeal of Prohibition. The Old Sam McFee Distillery was the lifeblood of the town until the government shut it down in 1920. Now, a decade and a half later, the McFee family still lives there, and they’re still dealing with the death of their youngest son. The father, Barley, spends his days with a bottle of booze, staring out the window at the broken distillery and neighboring potter’s field, where daily burials of the homeless go unattended. But on the one-year anniversary of the son’s death, a homeless man is buried in the field, and that night hundreds of other homeless come to pay their respects. This gets Barley and his oldest son William, an amateur reporter, out of the house to investigate who this homeless man really was and why he was so important. Turns out the man, Asher Keating, was thought by some to be a Christ figure. He helped clothe and feed the other homeless, by stealing. Some thought he performed miracles. Others thought he was just a magician and con-man. He was addicted to opium and some thought he was crazy, but there was no doubt that he changed lives for the good. A small miracle occurs on the distillery and William writes about it — the Potter’s Field Christ. People looking for answers during rough times come flocking to the surrounding woods to see the grave. Life returns to Twisted Tree, and also the distillery that had become its backbone. Soon barrels of bourbon are aging again in the rick house. But the attention isn’t all good. Barley was a secret bootlegger and gangster during Prohibition, under a different name, and now gangsters who have wanted him dead for years know exactly where to find him. Gangsters and bootleggers, sinners and saints all converge on the town of Twisted Tree for one last showdown. The novel deals with a lot of issues but ultimately is a story of father and sons, hope and redemption. Those who “create” usually tap into a personal “toolbox” of elements to define their style. For example, a painter might use color, light, and/or shadows to “sign” his work. A musician might use syncopation, key changes, or vocal intonation to set herself apart. What two or three elements most define who you are as a storyteller? I’d like to describe my writing style as gritty. I don’t shy away from dealing with heavy themes and I try to make my characters multi-layered and complex. Fast. I like to write fast and I like to keep the story moving. I’ve a big fan of dialogue, which probably stems from me also being a screenwriter. Don’t know if there’s a word for this, but I like to find beauty beneath the dirt. Take things from history that shouldn’t be all that pleasant and find the good beneath it all. And speaking of music, your first book, A White Wind Blew, had a musical theme. Please tell us a bit about it and what sparked the idea for the story. The Waverly Hills Tuberculosis Sanatorium in Louisville is known as one of the most haunted places in the world. I toured there initially planning to write something scary, something Stephen King would be proud of, but once I got there I was overwhelmed by the beauty of the building itself, the architecture and the history spilling from every room and window. There was no cure for TB and it was killing more people than bullets were even in the Great War. So I thought: What if this place really is haunted by ghosts? What is their story? And then I imagined the sound of a violin, and then a piano, and a doctor playing bedside, his musical medicine, as music therapy was not yet a thing back in the 1920s. He can’t heal their pain with medicine, so he does so with music, and ends up forming an orchestra with the patients. This book, like The Angels’ Share, also deals with themes of hope, redemption, race, and faith. What Bible passage, story or parable best describes your personal journey of faith? Full disclosure, I had to freshen my brain and look up some parables to answer this one, but I’d say the Parable of the Leaven. In it, a woman adds leaven to her flour, and overnight the living organisms in the leaven affect the dough, making it grow. I guess I can parallel this with my own life, taking certain events over the years, both positive and negative, and learning and growing from them. Without a doubt I’m the child in an adult’s body. My wife probably wonders daily just when I might grow up! We don’t have any pets, but I did have one pet as a child. A little mutt we named Fiver, after the rabbit in Watership Down. He lived a good, long life and was slightly yellow and he barked a lot! Thank you, James! It’s a pleasure to have you as a guest at Divine Detour. My pleasure, and thanks so much for having me! For more information about James and The Angels’ Share, visit his website or follow him on Facebook or Twitter.